Photo sharing might be all the rage these days, but Verizon’s exclusive Color app for Facebook lets you broadcast live video to your friends and family. 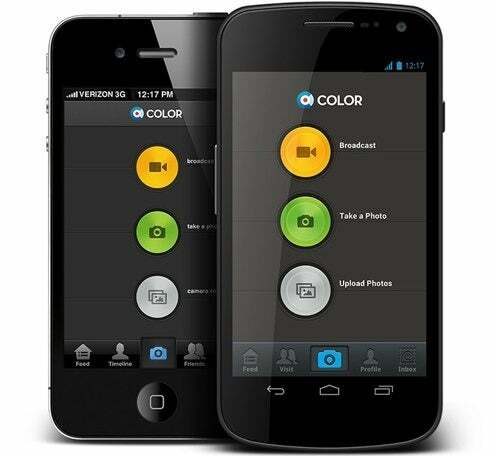 The app takes advantage of Verizon’s 4G LTE network, allowing you to stream up to 30 seconds of live video. I got a hands-on demo of Color at CTIA in New Orleans and was impressed with how quick and easy it is to start sharing video. Basically, you just start filming within Color’s camera app and you’ll start seeing your friends pop in at the bottom of the display. Verizon’s exclusive version of the Color app also has audio streaming support, a feature that the current widely available Color app does not have. The app also has a higher frame rate -- but it isn’t HD streaming. Video still looks a bit choppy, but in a blog post, Color founder Bill Nguyen said he aims to bring HD 720p streaming to the app with the help of Verizon’s 4G LTE network. “But the relationship with Verizon represents our entire vision for the future. One day in the near future, you will be able to capture every moment and share it LIVE in beautiful HD quality and you’ll have the recorded video to keep,” he wrote. As soon as you start broadcasting a video via Color for Facebook, your friends and family who also have the app will get a notification on their phone. They can then tune in to your video and watch whatever you’re filming live. As somebody who goes to a lot of live concerts, this is a great app for sharing with (or showing off to) somebody who wasn’t able to come along. With Color for Facebook, you can also do batch uploads to a Facebook album from your phone’s gallery. Basically, Color gives you a slick, one-touch way to quickly upload your photos. If you’re not a Verizon customer with an Android phone, you’re out of luck: You won’t be able to use Color for Facebook. But if you are on Verizon and thinking about buying a new phone, like the HTC Droid Incredible 4G LTE, you can download the app by dialing “**COLOR.” You can also get the free app from Google Play.